Happy EYG customer Phil Silkstone can vouch for the high-security standards of our range of composite doors, as his withstood an attempted break-in and ensured those attacking his home left empty handed. Mr Silkstone, of Halton, a district of Leeds, had recently upgraded to a new composite door from EYG as he was keen to ensure his home was as secure as possible. It was a decision which proved worthwhile just seven days later when he returned home at night to discover the door had been attacked around the lock area, but had stood strong despite those trying to break despite obviously having come equipped. “It looked like they’d had a good old go at the door around the lock with something like a hammer as there were plenty of marks and damage around the lock, but the door had stood firm,” said Mr Silkstone. At 44mm thick, EYG’s timber core composite doors are solid and one of the strongest on the UK market. They are Secured By Design accredited, a Home Office initiative to stamp out crime through accredited high-spec, high security windows and doors. The aim is to ‘design out crime’ through physical security and processes. John Waugh, retail sales director at EYG, said: “We always say that we are selling peace of mind when we sell our composite doors because they are so strong and secure, and they last for at last 35 years and are virtually maintenance free. “Security is the biggest thing for almost every customer we see, and although it is of course sad to hear that Mr Silkstone’s home has been targeted and that his new door has been damaged, it is great to know that it has done its job and kept people out. “It is clear from the pictures our customer sent to us that the people looking to break in came armed with equipment to force the door open as it had been badly damaged around the lock and there was also damage to the hinges. 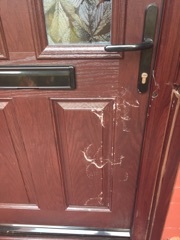 EYG is now arranging to replace the door for Mr Silkstone as part of his insurance claim following the damaged caused.